TERROR, CHAOS, FEAR AND PANIC: Many events of the end times are manufactured by evil men. But God has always used evil men to fulfill what’s been prophesied in His Word. To the many whose highest desire is to be left alone and “just live my life,” the end times must be a very, very disturbing time. Because the end times are not a time of peace and quiet. The end times are a time of separation: of separating the few who love Jesus and the many who have placed other things (idols) ahead of Him. 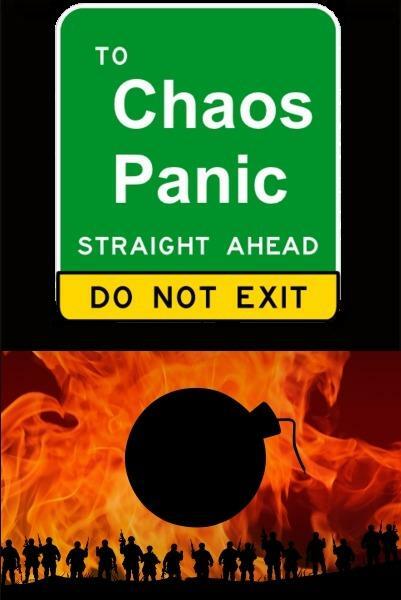 Chaos, terror, panic, fear: the end times will be hard on the unprepared. It matters little if the unprepared ‘bury their heads in the sand‘: events will overtake them whether they run away OR whether they stand still in denial. But, with all of the many warnings contained in the Bible, the only reason for being unprepared is unbelief. The end times are NOT an easy time for all those whose highest desire is to live a quiet life and concentrate on the things of this world. And we’re just getting started. 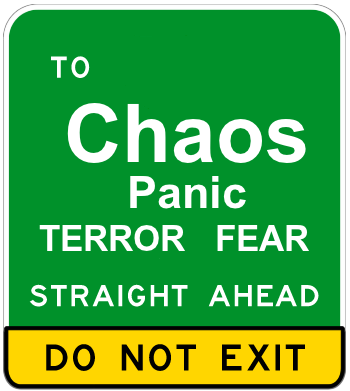 There will be MORE chaos, terror, panic and fear in the months ahead. Many events of the end times are manufactured by evil men for their own evil purposes. While evil men do not believe God, God has ALWAYS used evil men to fulfill what’s been prophesied in His Word. So, in a sense, the wicked (who do not believe God) are working for Him. Though God uses evil men to accomplish His purposes, believers are promised that God will use ALL THINGS, both good and evil, to fulfill His many promises to those who love God. Be assured: the end times are NOT a time of peace and quiet. Whenever chaos strikes, does the reader have an uneasy sense of foreboding or a feeling of peace? IF the reader is trying to live his life and is concerned for the things of this world, he is bound for disappointment. No, they only get worse. Trying to prepare physically is a fool’s errand. Only those prepared in the gospel of Jesus Christ will find their way.